That’s a new thing that mothers can do, by the way. If your mother is under a magic spell that puts her into a paralyzing deathlike coma, then she also gets the ability to know where you are, foresee danger in your future, and communicate telepathic warnings using pre-recorded sound carts. Seriously, they just invented that. It’s working out great so far. So this is going to be one of those stream-of-consciousness episode guide dream diary entries, where I’m just kind of breathlessly narrating what’s unfolding on screen. The theme, as always, is Dark Shadows: breaking new ground in the field of naturalistic drama. 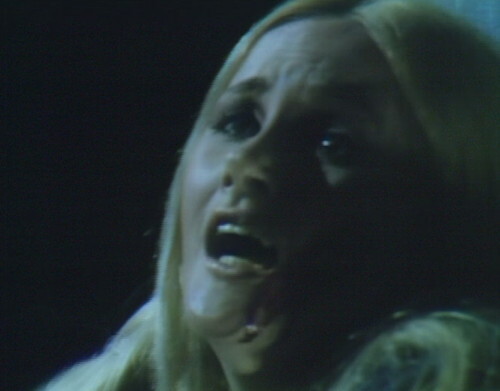 Here’s Carolyn Stoddard, who’s currently the bone in a supernatural two-dog fight. Her beast of a boyfriend has been following her around the estate the whole evening, and her mostly-dead mother has been sending her psychic messages, warning her that she’s in terrible danger. Unfortunately, Elizabeth’s public service announcements haven’t been particularly clear about what kind of danger she’s supposed to be looking out for, not even a general hint like “stay indoors”. As far as Carolyn knows, the danger could be anything from a bad cold to a drone strike. Carolyn’s on a daily soap opera, so naturally her response is to locate the nearest character and talk things over. She has a discussion with Julia, while holding a framed photo of her mother at a peculiar angle. 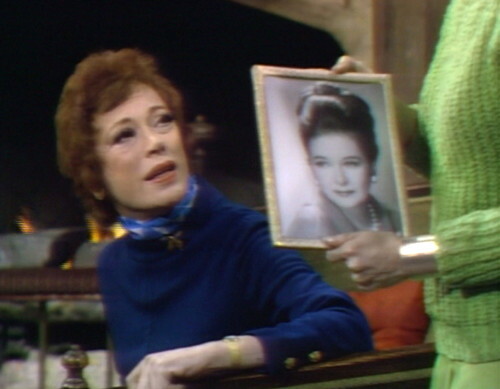 Cut to another camera, and it turns out Carolyn is holding her mother’s picture so that Elizabeth and Julia have a completely natural two-shot. There’s no rationale behind this bit of cinematography; it just is what it is. There will be more deeply peculiar touches like this in today’s episode. Like, a lot more. The conversation is about Carolyn’s unshakeable conviction that her mother isn’t really dead. Julia says that she examined Elizabeth, and she was definitely dead at the time, which means that either Julia is bad at being a doctor, or Elizabeth is bad at being dead. But Carolyn Stoddard doesn’t take no for an answer, and she’s determined to get to the bottom of this thing once and for all. So she goes outside to walk through the spooky dark forest to Elizabeth’s tomb and have it out with the dearly departed, without taking a flashlight or a gun or a portable force shield or anything. She doesn’t even have a hat on, and it’s January. Obviously, this little one-way field trip to the boneyard is exactly the opposite of what Elizabeth was hoping to achieve with her cryptic threat level announcements from the other side. You know, you really do need to be more specific with your telepathic prophecies. I feel like we’ve discussed this before. Honestly, nobody listens. And just as Carolyn gets out of range, the werewolf LITERALLY DROPS FROM THE SKY onto the front porch. He really does — it’s a vertical drop from the top of the screen, landing on his feet, and then it’s on with the stalking. The werewolf is full of tricks like that today, because Dark Shadows has a stunt coordinator and damn it, they’re going to use him. After a while, I may be doing the entire entry in all caps. Finally, a television show that tells the truth about the danger of low-flying werewolves. Then we get your standard girl-being-stalked “who’s there” reaction from Carolyn, while the soundtrack goes mad in the background. It’s all brass and strings and timpani and the walking-on-leaves sound effect. Then she gets to Liz’s tomb, and the werewolf JUMPS OVER THE WALL AND DROPS RIGHT NEXT TO HER, snarling and running and all in caps because THE WEREWOLF IS AWESOME. I know I keep saying that, but it’s the only possible reaction. Every show should have leaping werewolves; I can’t think of a single program that this wouldn’t improve. It would perk up Grey’s Anatomy something fierce. 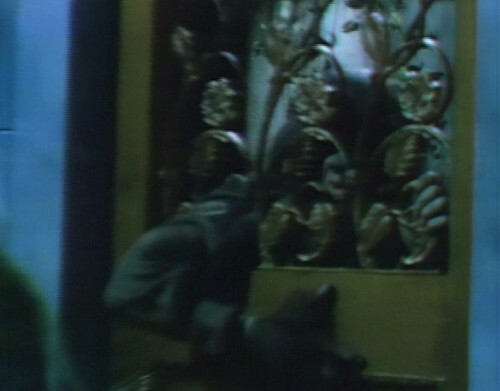 So Carolyn rushes into the mausoleum and locks the door behind her, with the beast reaching through the ironwork to grab her. And she’s shrieking now, an extended high-pitched squeal guaranteed to let the next-door neighbors know that you’re not currently attending to your science fair project. This is how TV programs used to do viral marketing in the days before social media, by just being so loud that the entire neighborhood could hear it. And there’s the wolf, and the drums, and more snarling dog sounds, loud enough to wake the dead. So guess what happens next. Yes, it’s time for the late Elizabeth Collins Stoddard to step in and, well, lie there and fret at the moment, but she’s working on it. “Carolyn!” Liz cries, using her inside voice. “She’s in danger! I’ve got to help her!” Admittedly, she hasn’t helped much so far, but she’s trying to catch up. So then — oh, how I love the werewolf — he actually goes and PICKS UP A ROCK and starts smashing at the door handle. He’s using tools now, a whole new stage of vulpine evolution, unfolding before our eyes. Then we take you live to Liz’s cold, dead fingers, a couple inches away from the button that will save her daughter somehow. Before she died, Liz declared that she wanted a button in her coffin so she could call for help if she woke up. Everybody thought she was crazy at the time, but who’s crazy now? Besides the show, I mean. “The bells!” she thinks, furiously. “If only I could manage to make them ring! If only I could manage to press the button!” It’s terribly exciting. Honestly, this episode has everything but sense. And then Carolyn and Vicki sit quietly by the fire, listening to the thunderstorm. Except not really, because that was the kind of thing that happened on this show two years ago. Now we have vicious drooling monsters busting in and jumping over coffins to get at Carolyn’s tender girl flesh. They don’t really classify what lightning makes it all seem like anymore. They have other concerns. So the werewolf grabs Carolyn, and gives her a vicious slash across the face with his claws. It’s a brutal moment; he’s basically ripping her face open. Kids must have been absolutely screaming by now. The whole neighborhood’s in an uproar. And finally, Elizabeth, in a selfless act of pure heroism, decides not to be dead anymore. 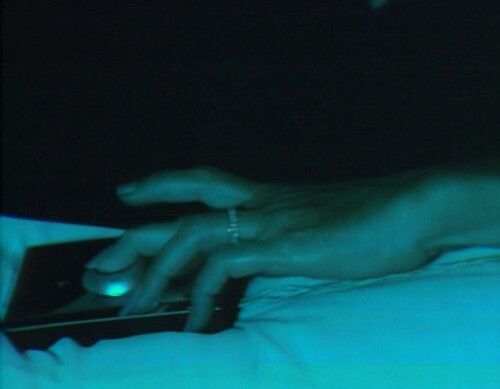 Her fingers move and she presses the button, setting off a whole new array of bells and whistles. Startled, the wolf backs up a step, and Carolyn cringes against the stone wall AND THERE IS BLOOD ON HER FACE. 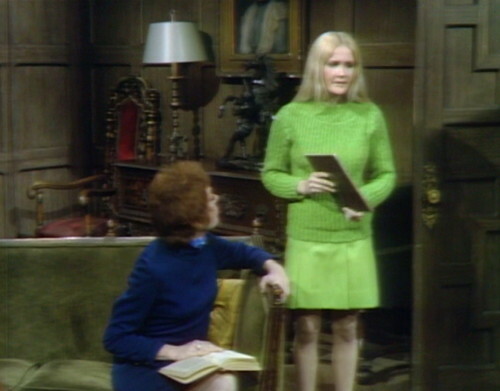 Then cut to Barnabas and Julia in the Collinwood drawing room, pricking up their ears like woodland animals hearing that Snow White is in danger. 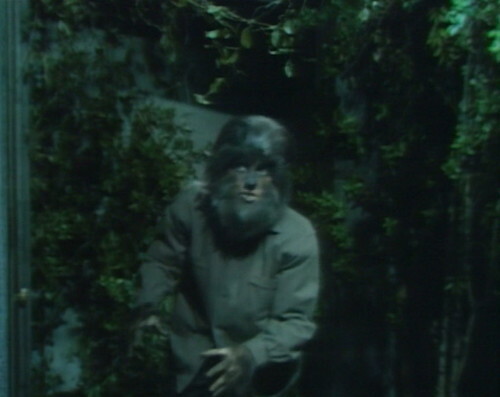 This slows down the werewolf by about half a second, and then he lunges for Carolyn again. He really has his heart set on killing her; he wants it more than anything. It’s not clear if he’s planning to eat her or what, but he’s got something in mind. And then — Carolyn puts her hands up to her face, and the werewolf spots her silver bracelet, and he backs off. Saved by the accessories! And the bells are still going, and the timpani rumbles in the background, and Carolyn looks at the insane carnival that her life has become, and she re-evaluates about two-thirds of the decisions that she’s ever made, and she screams like fingers dragged across a chalkboard made out of nightmares. And then Barnabas and Julia rush in, and here’s Dracula Meets the Wolf Man: The Home Game. Barnabas lifts up his silver-headed cane, and just whales the ever-loving tar out of the creature, and there’s more shrieking and growling and kettle drums and warning bells. It is absolute pandemonium. It’s a thrilling action sequence that could only happen on Dark Shadows — only here, only now, in January 1969 at four o’clock in the afternoon. For a limited time only: the secret of television, just standing there, screaming at the top of its lungs. That breathless hush that you hear is a nation of housewives and teenagers and children and mental patients, as nobody touches that dial, all at once. 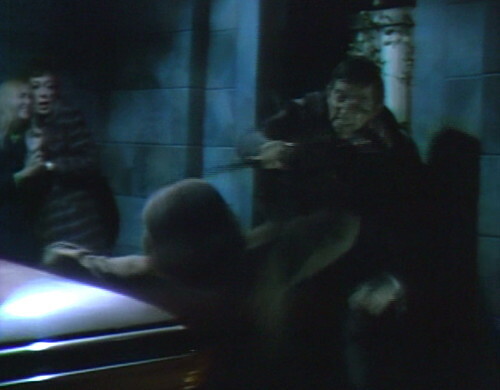 When the werewolf leaps on Carolyn, he knocks against Tom Jennings’ gravestone, which wobbles. The bells actually start just a moment before Liz presses the button. 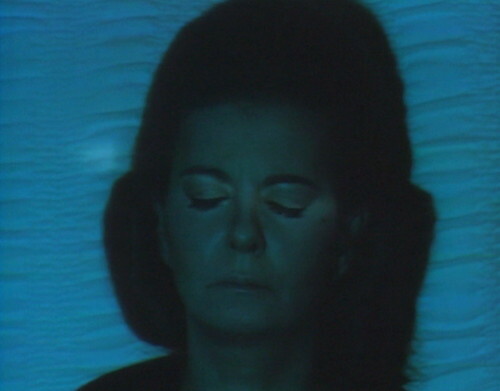 They open up Liz’s coffin, and Julia examines the body, actually sticking her head all the way inside the casket. Elizabeth has been “dead” for three weeks; you’d think a doctor would notice that the body hasn’t deteriorated at all. On the other hand, it’s been a rough night. 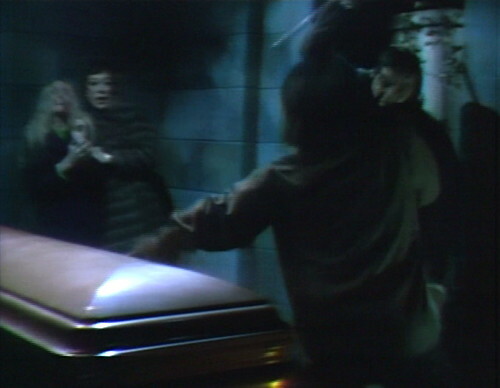 Barnabas shuts the door to Liz’s tomb, and it swings back open again. After Julia takes Liz upstairs, there’s a stretch of 2 minutes and 50 seconds with no music cues at all. 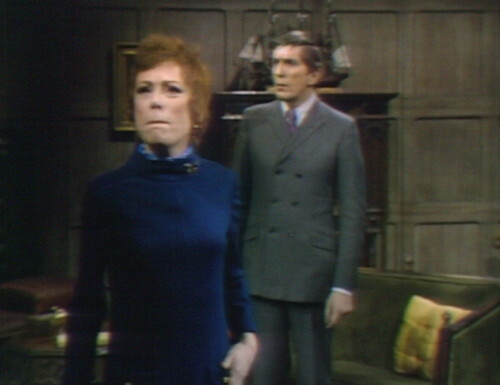 Some of this time is silent action — Barnabas getting the gun, putting on his cape, Julia walking downstairs — that would usually be accompanied by music. You can hear several bangs and clatters from the studio during this lengthy stretch of silence. When Carolyn goes upstairs to see Liz, the boom mic is visible at the top of the screen. The werewolf can use tools. How did we not know this before? Is anyone else terrified? Alex Stevens is the best thing that ever happened to this show. Nancy Barrett sells her part as the hapless victim and more. 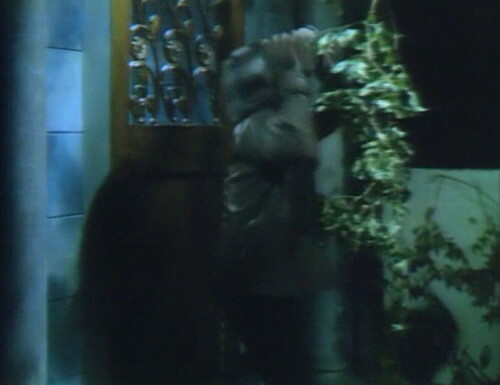 Stevens really does drop perilously close to Barrett, just missing her by inches at the mausoleum entrance. Elizabeth returns from the dead after weeks lying in a coffin, and the first order of business is getting her to bed. Because resurrections are so tiresome. I also assume Julia gives her a sedative – to relax her from the weeks of lying in a coffin. I always thought if someone got scratched by a werewolf, the scratchee becomes a lycanthrope, too. Apparently this isn’t the case in the Dark Shadows-verse as Carolyn doesn’t become a werewolf after getting scratched in this episode. At least, not until she’s played by Chloe Moretz in the Tim Burton version of Dark Shadows. Delayed reaction, I guess. I think in most werewolf legends you need to be bitten in order to be infected with the curse, not just scratched. You may be thinking of zombies. Legend has it you must be bitten by a werewolf , then if you servive you will become a werewolf, too. A. Put under a curse. B. Be born from a bloodline from someone who was already cursed. I think Barnabas tells Julia that being bitten is a way, according to his reading on the subject. Must bring back memories. Maybe Julia, by sticking her head all the way in the coffin, attempted to give Liz mouth-to-mouth resuscitation. After being dead for 3 weeks I would think it would be a long shot, but she’s the doctor. She didn’t have her bag with its stethoscope, so she had to listen to the heart the old fashioned way. 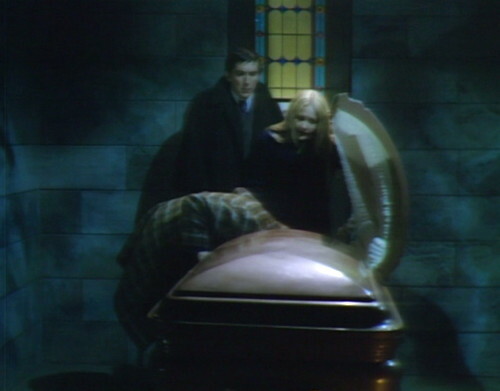 I believe this episode officially ends “The Great 1968 Wrap Up” with Liz finally telling Barnabas & Julia how her fear of being buried alive got started. Wow, was this action packed episode really written by Sproat? I mean I guess someone was locked up for most of the episode, (Liz in her coffin) but still. I guess he’s decided to go out with a bang. It was because Sproat was especially lazy today that this episode worked so well. All he had to write was, “Werewolf chases Carolyn. Carolyn runs and screams,” and let the real talent, Alex and Nancy, do all the work. If any thanks are due to Sproat, it’s for staying out of the way. Did you hear about the rumble out at Collinwood, tonight? It was out by the graveyard, next to the swing-set. Barney Fang, a member of The Capes, clobbered Hairy, from The Howlers, over some doll named Mimi Screamerton, with his silver cane. He’s a member of the cane gang. This is one of my favorite episodes. No explanation needed. That stretch with no music is very odd. With no score, the atmosphere quickly fades. If it wasn’t for the music, I might start asking questions, like why doesn’t this make any yada yada? But the musical score has a nice brain-washing effect, leaving me uncluttered with questions, complacent, entertained, and yet, still more or less life-like. Willie stopped Adam from doing horrible things, with some shiny earrings. Carolyn’ s silver bracelet stopped the werewolf. Too bad no one ever come out with a special line of jewelry, specially designed to stop monsters. A stellar episode with great performances all-around AND plot advancement. And wow…watching Alex Stevens’ work…beautiful! His stunts added terrific layers to the show…! I remember when I got the soundtrack album in the 80’s and there was a picture on the back of Barnabas beating the werewolf, and I was like, When does this happen? Every time I turn it on they’re just sitting around talking. But I hadn’t seen much of the show at that point. Funny thing. When I watched this episode yesterday, my wife walked in at that moment and asked what I was watching because it sounded horrible! I thought Julia was especially nonsensical in this episode. Carolyn comes back and tells her that Chris’s cottage has been trashed–overturned furniture and broken glass–and Julia just smiles and says she wouldn’t worry about it, and that she KNOWS Chris is all right. Then when Carolyn tells Julia that she heard her mother’s voice warning her, the good doctor says that’s impossible because her mother is dead. This is the woman who has been playing with a vampire for a year (and has with full knowledge helped protect him from a witch/vampire and a flunky of Satan), helped bring two dead Frankenstein bodies back to life, and just a week ago pulled a guy who had traveled 175 years back in time back into the present. Honestly, I was doing dishes in the other room when Carolyn’s screams brought me back to the living room. If it has been 4pm and I had been whacked out on Miltown it would have been like I was back in 1969. And god bless that werewolf trying to get past the maousoleum gate. He looked like my dog trying to reach a grape that’s rolled under the fridge. Julia is obtuse throughout this episode. She makes excuses for misdiagnosing death. She should have surrendered her license episodes ago. Speaking of incompetent, the local authorities either never knew that Mrs. Stoddard had died, or they will never raise a hair about her miraculous resurrection.